Fredericton / NB DJ up for a DJ Award with Drake and other Grammy Winners. DJ Nasty Naz, has yet again been nominated for the 5 time – for the Annual Stylus DJ & Artist Awards – Powered by Pioneer, Rogers Wireless and HP. 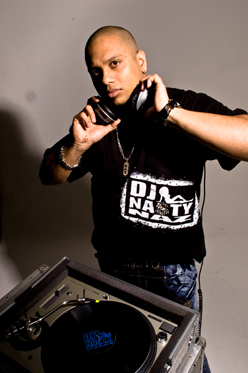 DJ Nasty Naz – has been nominated as the ONLY DJ from NB, for the East Coast DJ of the Year, which covers 4 provinces – Nova Scotia, PEI, New Brunswick and Newfoundland. Naz has most recently been Multi Platinum Sean Kingston’s tour DJ and tour Hypeman and has had the blessing of performing in Saudi Arabia, New Zealand, Australia, Paris, UK, across the US and Canada, with acts like Timbaland, Akon, Justin Bieber, Selena Gomes, Lauryn Hill, Shaggy, Sean Paul, Wyclef Jean etc. He was even hired by the government to perform for a number of shows at the 2010 Vancouver Winter Olympics. The Stylus Awards are a unique facet to the DJ and club culture in Canada. As the only institution recognizing the breadth of DJ talent in Canada; Stylus are able to bring a forum that allows DJs and Canadian Artists to display and perform their talent to the Canadian Music industry. The events throughout SpinFest and the Stylus Awards harbor performances, a national music conference, concerts and local events, all allowing Canadian Artists and DJs to flourish and be recognized. And some Grammy nominated producers like T-minus – produced Moment for life by Nikki Minaj ft Drake, How Low – Ludacris, T.I, Ciara, Lil Wayne and Mya. AND Boi1da – has produced for artists and groups such as Kardinal Offishall, Usher, Jonas Brothas, Drake, Eminem (not Afraid, with Dr. Dre), K-os (Crab bucket) and 50 Cent & G Unit. Think of these awards….like tha Grammy’s but for the Urban DJ and Artist Community, and held in Toronto. I would like to thank you all for your continued support and for believing in me thus far. I am also open to all interviews regarding this nomination.